Frigidaire is recalling about 35,000 washing machines due to a defect in the drain pump that causes heat to build up and pose a fire threat. These units were sold from February 2009 to May 2009 from Sears and other retailers. This recall includes top load washer, front load washers and laundry centers manufactured under the names of Crosley, Frigidaire, Kelvinator, Kenmore, Wascomat, and White-Westinghouse. If your washer is involved in the recall stop using it and unplug it. Contact Frigidaire immediately or Sears, if your unit was purchased from there, for your free repair. 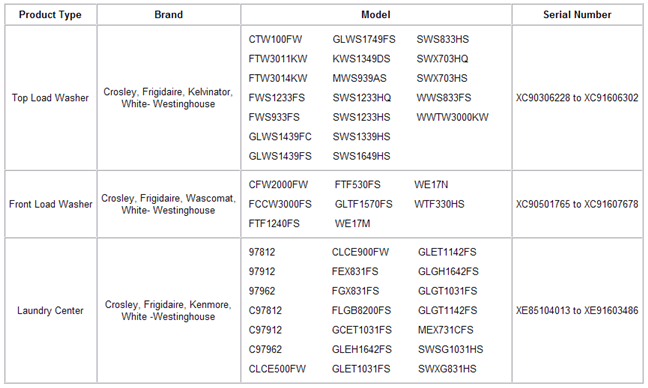 The following chart shows model and serial numbers for the recalled products. If you are unsure where to locate your model number see the photos on the Consumer Product Safety Commission Website Here.